If there is one product I think is essential for my skin routine, it’s sunscreen. It’s honestly a product I use everyday. From my understanding (correct me if I am wrong), unprotected skin filled with acne scars + direct sun exposure = darkening of the acne scars aka STOPPING YOU FROM GETTING YOUR DREAM CLEAR SKIN! A BIG NO NO! Instead of going to Faceshop like I usually do, I looked around and randomly chose a new place; Skinfood. I generally am a SkinFood fan for their skincare products and their overall look (look at the little honey pot thing that Joy has and tell me that isn’t cute), so I had no problem really getting sunscreen from there. I asked one of the nice workers at store to recommend me a sunscreen and gave me the Peach Sake Sunscreen Lotion because it apparently controls oil. My first thoughts were, ‘…is my skin looking that bad today that she needs to point out my oilness! ?’, but you know… my skin was oily that day so I couldn’t really say anything… but still… feelings were slightly hurt. I still bought the sunscreen anyway and have been using it for a few months now. 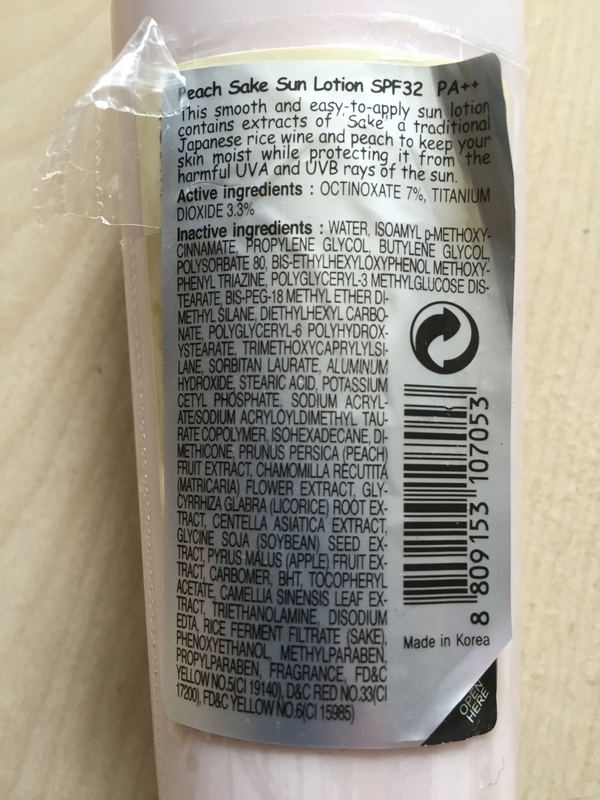 As said in the front of the bottle, the sunscreen has an SPF of 32 PA++ and has 75ml in it. Usually, I go for higher SPFs when possible, but 32 is good enough especially for just day to day use. The sunscreen does have a long lifespan as seen in the picture above, it will last until December of 2016 and was packaged on July 2nd, 2014, so a little over 2 years. When I first saw the sunscreen, I thought it was way heavier than it looked. I think it’s the way cap was designed to look a little like wood, but the whole bottle is extremely light. The bottle is a shade of pale pink that is reflected in the actual sunscreen itself, though it’s hard to tell from just looking at it in a photo. As it’s namesake, the sunscreen does smell like peach sake, but don’t fret people who don’t like sake or alcohol! You smell more of the peach and the overall smell usually goes away pretty quickly, within about 10-15 minutes for me. The sunscreen is easy to get out since the bottle is squeezable. The formula itself is watery and easy to spread around, so it will last quite a while since a little goes a long way. Now the big question; does the sunscreen control oil like the lady said? I have to say: it depends. When it comes to just going on a leisurely stroll out and just hanging out with friends, it’s a basic, good sunscreen and controls oil pretty well. However, this sunscreen does not do well with a lot sweat. It becomes shiny and oily on your skin when mixed with sweat. It is a complete no go for people who use this before going to the gym or days that it’s really hot and humid. Sometimes when I’m extremely oily (like when mother nature decides to wave the middle finger at all the ladies of the world aka your period), the sunscreen doesn’t do well holding my oil. I will become shiny quickly, starting with my forehead and where my glasses rest on my face. This sunscreen isn’t waterproof, but there is merit to it because it will come off easily at the end of the day. Don’t expect it to hold up on a nice sunny day to the beach though because it will be gone after a quick swim. Other than these three faults of the sunscreen, I still do quite like it. I would highly recommend it for a winter sunscreen though and for those who don’t mind paying around 15 dollars or more (cause it’s freaking expensive on amazon o_o) for a sunscreen. If you live somewhere that is hot and humid, you should pass on this because it will not hold up. I can say that I will be switching sunscreens very soon because of the incoming warm weather and don’t want to offend anyone by looking like a grease ball. Or not! The sunscreen is trying to resist!